In Windows 7, we can enable remote desktop as follows. select the second check button ‘Allow connections from computer running any version of remote desktop‘ . If the other machine which you would be connecting from is running on Windows 7 then you can select the third check button “Allow connections only from Remote computers running remote desktop with Network level authentication (more secure)“. If you would be using down level OS like XP, Server2003 then select the second check button. Open group policy object editor and navigate to the below node. 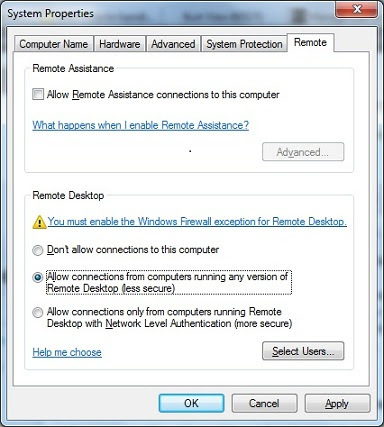 In the right side pane, double click on the setting ‘Allow users to connect remotely using remote desktop services‘ and set the status to enabled. To disable remote desktop using group policy settings, you need to set the status of the setting described above to disabled. If you want to leave the choice to the individual users, you should set the status to ‘Not configured‘.